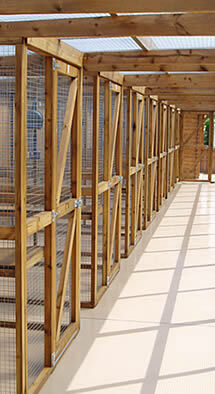 The cattery comprises 15 spacious individually heated chalets with outside covered runs. It is built to the high standards set by the Feline Advisory Bureau (FAB) and is fully licensed under the Animal Boarding Establishments Act 1963. There are 10 units that can accommodate 2 cats from the same household and 5 family units that can accommodate up to 4 cats from the same household. All cats are fed twice a day with high quality food and any specific diets can be catered for, (veterinary prescribed food would need to be provided). Everything will be provided for your cats’ stay, but you are welcome to bring a favourite blanket or toy to help them settle in. Cats will only be accepted with a current vaccination certificate against Feline Infectious Enteritis and Feline Upper Respiratory Infections (cat flu). Vaccination must be completed at least 14 days prior to boarding. Please remember to bring the up to date vaccination certificate with you when you board your cat. Cats should also be up to date with their treatments against fleas and worms before being admitted to the cattery. Cats will be examined on arrival and to safeguard the health of all our boarders, we reserve the right to refuse admission of any cat showing signs of ill health. We regret male cats over the age of 7 months that have not been neutered cannot be boarded. Please bring your cat to the cattery in a secure suitable cat carrier.